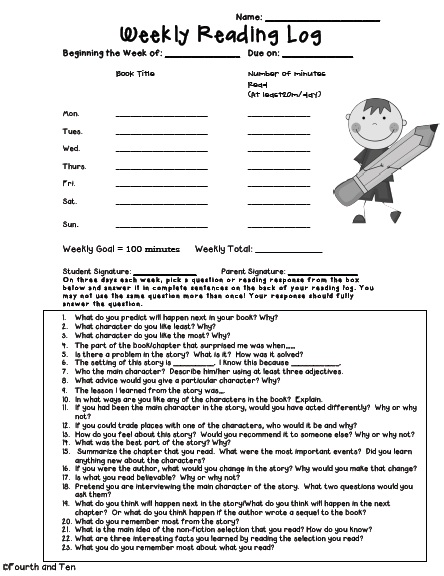 Earlier in the week, I shared my resources for my reading response journals on Amber's blog. This freebie has been downloaded from TpT almost 1,500 times! Wowzers. :) This easy to implement reading resource is one of my favorite resources to use in the classroom and I'm so HAPPY that many of you found it useful too. 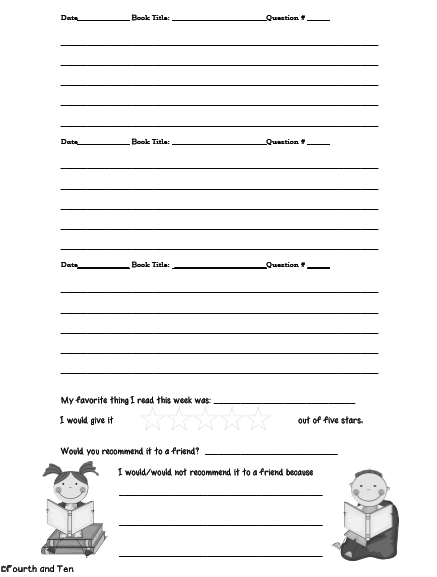 Today I wanted to share with you another reading response freebie with you, my home reading log. I used this baby for four years when I taught third grade, and LOVED it. Thanks to Scrappin' Doodles, Hello Literacy, and Fabulous in First for the graphics and fonts. Love them! Each week I required my kiddos read 100 minutes a week. Our reading log went home on Mondays and was due the following Monday. Ideally, I encouraged my kiddos to read 20 minutes a night, five days a week, but with sports, dance, and all the other things kiddos were involved in, I often saw logs with 50 minutes during the week and then 50 minutes over the weekend. Third grade, in my state, is the first year our kiddos take high stakes assessments. What most of them really struggled with at the beginning of the year in third grade was creating decent responses to test questions, as so many wanted to write simple response made up of just a few words. 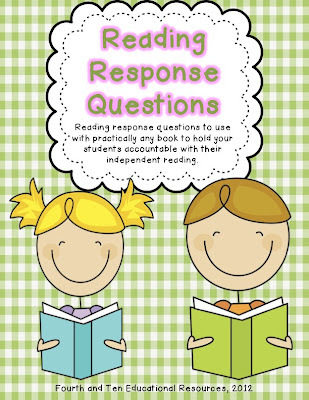 My reading response journals and reading response home reading logs, in addition to regular classroom practice and instruction, really helped my third graders get comfortable with creating quality reading responses. I stressed what quality responses looked like at open house with the parents, and put a completed reading log in my parent resource packet. This really helped the families in my room really understand what was expected of their child. My fourth grade team does not do reading logs. I know there has been a lot of talk recently that reading logs can do more harm than good and cultivate readers who just read until a timer goes off and then stops, instead of readers who do have a passion for reading. That was my team's rationale for no longer requiring them, which I totally understand too! I've tried giving beads for books read independently, awarded once a month, hung on lanyard in the class. I think adding the letter home and a GOAL of 100 will help! We use the Book-It Pizza Hut program at our school, and students have to read 20 books each month to earn their pizza hut coupon. For students reading a chapter book, I let them count a chapter as 1 "book" entry. Thanks for sharing Lisa! This is a great resource! I love your blog and nominated you for an award! Check out my blog for more info! Wow - I love this! 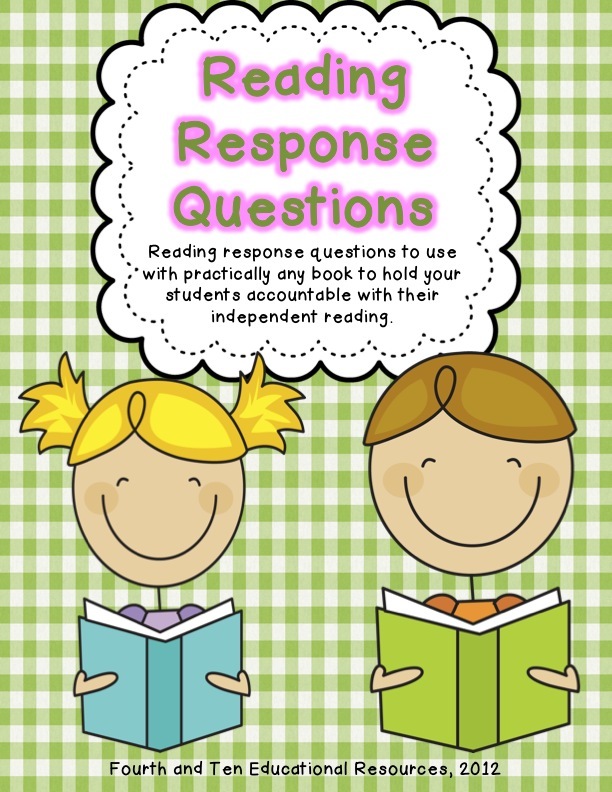 It's a great idea having students answer reading response questions! Love the reading log! I've been wanting to incorporate reading responses with their reading homework!! Experience ensure to update to exceptional membership from cost-free mobdro you can still use its cost-free variation. It makes it possible for users. Create a brand-new account to move forward, you will now just focus on Musical.ly Sign In the Musically Login on your tool On the gadget, you could keep.